Christmas Books for the Kids! Also, Gift Books for the Dog Lover! I'm rapidly running out of time, so I'm doubling up on posts here. I received a few lovely Christmas picture books for review that I want to mention because I really love nothing like I love Christmas picture books. And I don't think it's too late in the season to find some new ones to enjoy! So! When this arrived, I cooed over it because it's so darn cute. 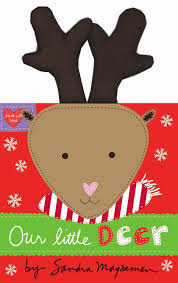 There are actual little felt antlers sticking out of the book that you know the baby in your life is going to want to get their hands all over. And inside is a cute little message of adoration for the little one in your life...reminding them they are deeply loved and have an important place in your family. And the pictures are so cute!! This is a book to wish your little one a Merry Christmas. 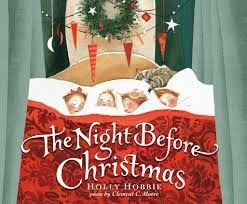 The Night Before Christmas is certainly a classic and evokes the wonder of magic of Christmas like no other book. If I had limitless space, I'd probably collect various illustrated editions of this book because I really enjoy it so much. And I remember the little pop-up book I had when I myself was a child and how completely worn down and worn out it was! So I think picking the right edition for your family is really important. I really do enjoy this edition illustrated by Holly Hobbie--it has a classical old time feel to it, without being too lavish. The colors verge on being a bit light for my taste, but really there's nothing bad to say about this book. A worthy choice to fill the need if you have it! I was completely charmed by this twist on A Night Before Christmas, though. 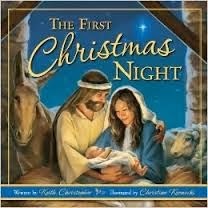 If you want to focus your children's attention on Jesus's birth instead of Santa's arrival, this is the book for you. It's a rewrite of the classic poem, instead talking about the night Jesus was born. It's so cute, especially if you love the nativity story as much as I do. 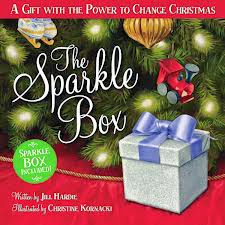 If you're really looking for a way to incorporate a gift for Jesus into your family celebrations, than The Sparkle Box is the perfect choice. This is a cute story that introduces children to the idea of giving to others as a way of giving to Jesus at Christmas time. As you head into the final Christmas week, why not look for ways to share with others as part of your celebration? The book includes a box that can be used to write down all instances of kindness as a present to Jesus. Know someone who is very enthusiastic about their canine friends? Well, here are a few fun/unique books to keep in mind for them. 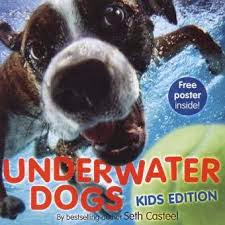 This picture book by Seth Casteel features many pictures of dogs underwater managing to look both terrifying and completely and adorably doggy all at once. There's no real plot to the text, but the pictures are awesome! And you can use the book cover as a poster. What's not to love? This is a similar concept to Dogs Underwater in that it features simply pictures of dogs in various stages of shaking against a black backdrop. 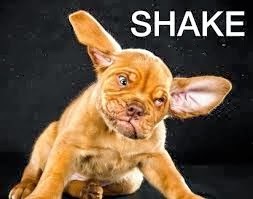 All different kinds of dogs in all different stages of the shake. It's hilarious, and sure to please any dog lover! Some of these poems genuinely made me laugh out loud. This is just a fun book that anyone who knows what life with a dog is like will enjoy! 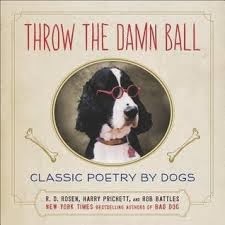 The poems are accompanied by pictures of the dogs who wrote them and where they're from! Please note! I received complimentary copies of all of these books either for review or as a giveaway win. I enjoyed all of them so much, to which I say--LUCKY ME!